these guys are so dorky and so cute that i had to share their song. enjoy! one of the perils of surfing the internet is reading an article like the one xojane chaya wrote. i realize i am a week late in giving my 2 cents but i will give one anyway. i found the article to be a bit too vulgar for my taste. i think that chaya was trying to sound hip and perhaps i am not as hip as i would like to think i am , but i think that i speak for a lot of people when i say that i thought her article was less than hip. i would have preferred a more demure rendition of what it is like to be a lubavitch baal teshuvah without using the v or f words. i do not think that she had to stoop to the lowest common denominator to prove her point. very interesting. rabbi krohn wants to ban the comments sections in vos iz nais (i know i spelled that wrong) because they may be lashon hara. oh and most probably because he doesn't agree with them. what i most have a problem with is how he thinks he will put bloggers in charem when according to him no one should be blogging or reading blogs anyway so how would anyone know who the bloggers were to begin with to ban them? the other thing is that this kind of threat only has power if the person you are threatening respects the people banning them. 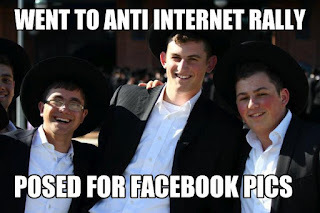 personally i think that all these rabbis should forget about banning the internet and live exemplary lives and show how beautiful living a torah life is without having to badmouth technology. the strength of the torah and a torah true life should be speak for itself. 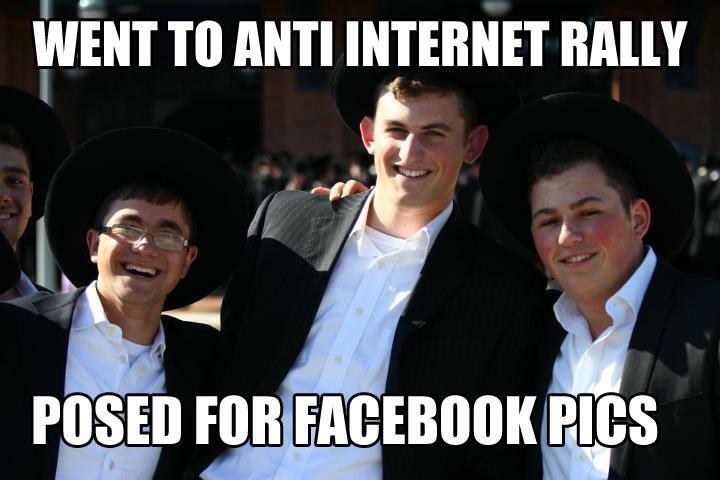 anyway i think that its quite funny that all these rabbis dislike the discussion about judaism that occurs on blogs. judaism is all about discussion , especially in halacha. there are lots of opinions and then there is what the halachah is . discussion about what is right and wrong about judaism is so integral . this is what separates us from the goyim. the fact that we CAN ask questions proves how true the torah is. i used to go away a lot for shabbos and yom tov. after awhile it got old. i realized that i actually like staying home . i like sleeping in my own bed. i revel in the privacy. i do not stay inside the whole yom tov when i choose to stay local. i go out for some of the meals. i go to shul. its just that when i stay home i feel less like the displaced wanderer. this year i am especially glad to be staying home for yom tov as we are cheated out of the secular holiday of memorial day. memorial day is the second day of shavuot this year. for some it is fortuitous that the two fall together because they do not have to use another vacation day for the holiday, but i have a ton of vacation days anyway and miss having another non yom tov day off. staying in my apartment will help me be less frazzled when i go back to work on tuesday. i always feel more rested after a yom tov when i don't go away. when i am home for yom tov i do not have to deal with the post yom tov unpacking. just the post yom tov cleaning. have a great shavuot wherever you may be. is it better to just go with your gut and apologize later or is it better to think before you do things and apologize if necessary? since i am posing this question i guess you know what group i belong to. i suppose a little bit of both is the best way to go. it is good to take risks but sometimes people hurt other people's feelings with what they do and they figure that they can just apologize and it will be okay. in my opinion you can apologize to me and i can forgive you but to forget is a lot harder, especially since i have a freakishly good memory . it is also hard to forgive someone when it seems as though they are disregarding my feelings instead of hurting my feelings unintentionally. people will do the wrong thing whether they are impulsive or introspective. people s$#ck. for one's own sanity one has to forgive others to maintain sanity . if you are lucky you can even forget about how inconsiderate others are. i remember reading the following saying in a book when i was eighteen years old . 'you can never go home again' meaning once you leave home you can never go back to the way it was. as a young adult that meant being independent when i was out of town but when i visited my parents it was hard to still be the kid. time passes and the meaning of this proverb changes. eventually you find a job , friends and perhaps you marry or have children. you busy yourself with the things that are important to you. one day you visit your immediate family and then you realize that though you love them very much you have a life that is very separate than theirs and that you miss that life tthat you have created when you are away from it. suddenly you realize that you are all grown up . i have heard a lot of nonsense about banning the internet etc.. etc... and the evils of the internet ..blah..blah .. blah. ... well folks the internet is a fact not a choice. we all need to access it whether we want to or not. we need it for work , we need it for keeping up with health issues, bank issues and personal issues. i use the word need because we need it. i will also agree that the internet can be used for good and evil just like anything else. i think that i have read more divrei torah since i have had internet access than before i had internet access. i think that the religious discourse that goes on on blogs only strengthens the jewish people and not the opposite. if you really believe that the torah is true and you are truly observant then the bad that is on the internet is not going to tempt you so much. i for one am not a gadol hador and i do not go to any internet sites of improperness . in this sea of fools i have finally heard the voice of reason by rabbi manis friedman. i have included this link "We're Stronger than the Internet". i am not lubavitch, but i totally agree with his reasoning. my favorite line is where he says that improper thoughts can pop into one's head randomly so that does not mean one shuts off their brain. i agree that we all have to be careful with the internet, but it really is more good than bad. wishing everyone a happy yom yerushalayim! its been 45 years plus! i found this quite enlightening. i saw the kehinde wiley exhibit at the jewish museum this past thursday. i did not think that i would like it as much as i had. kehinde wiley is a black man who has made paintings of men of color who have been influenced by american black hip hop culture around the world. one of the countries that he has gone to was israel . he was particularly fascinated by ethiopian jews in israel. this is an exhibit about israelis and was made in conjunction with the jewish musem of new york city. the paintings are large and they meld together ashkenazic , sephardic and ethopian jewish cultures. the exhibit displays paintings as well as torah ark curtains and religious oriented papercuts . wiley incorporated patterns from these very ashkenazic jewish items into the portraits of ethiopian jewish israelis. above each painting is a mini torah ark with lions . for the jewish men portrayed the ten commandments are written and for the israeli arab portraits there is the rodney king mantra "why can't we all just get along" written in hebrew. the melding of all the different cultures in each painting is quite beautiful. this video that i have posted is also at the exhibit . when i viewed the exhibit there was a free tour . it was quite detailed and without it i would not have understood as much of the hidden meaning of each painting as there is not much text in this exhibit. unfortunately the tour is only given on weekdays . perhaps the artist wanted the paintings to speak for themselves. even if you do not see a guided tour of this exhibit it is still worthwhile to view it. i will wish you a shavua tov with this fabulous proverb that i stumbled upon on facebook. "i'm sorry if the middle of my sentence interrupted the beginning of yours"
my most favorite story in kindergarten was where the wild things are by maurice sendak. i always loved to imagine visiting the land of the wild things. maurice sendak died on may eighth. a great children's story teller is gone. his stories will live on. there are a lot of fun singles activities out there for unaffiliated jews in the form of kiruv organizations. if you have always been frum or frum for a long while you are not welcome there. you get to go to the mediocre events for the forever frum. if you are frum and single and you go to an event for the not necessarily frum crowd you may not be the exact frum that organization is pushing so you may be a 'bad' influence. perhaps the crowd will influence you negatively. oh and chas v-shalom you might actually meet someone there and get married to them. maybe you will grow together, maybe you won't, but you might have gotten married and on to the next step. i never understand why there aren't more organizations bent on keeping others frum as opposed to being mekarev those who are so far from judaism that its almost like you are converting them when you mekarev them. dont't get me wrong, i am not against kiruv. i just think that if the kindness and patience extended those who are not frum was extended to those who are currently frum there may less who go off the derech. its really less work to keep the currently frum connected because they still know the path. when you live near your family it is easy to visit them for a short while and then go home . when you live further away you don't have to see them as often but when you do its in a large dose that probably involves an overnight stay. it can be nice but in another way it can be overwhelming. when i am away from my family i miss them but when i am visiting them i miss my freedom. i guess that's par for the course. the other difficult part about living far away from the rest of one's family is that when you know some relatives are older you fear that every time you see them may be the last. there can be a lot of good reasons to live far from one's family but it really is a mixed bag of emotions. Wishing all the mothers out there a happy mother's day. i just finished reading rebecca skloot's book called the immortal life of henrietta lacks. what starts out as a book about a poor black woman with cervical cancer in the early 1950's morphs into a book about medical ethics. henrietta lacks was 31 years old and died of cervical cancer. cells were removed from her tumor without her knowledge or consent . these cells grew into a group of cells called HeLa that have been instrumental in finding a cure for polio, in developing cloning and in-vitro fertilization. eventually doctors made a lot of money due to henrietta lacks' cells. meanwhile poor henrietta died at 31 leaving 5 motherless children who still can't afford to have health insurance. black people were a large target for medical experiments that were given without the patient's consent, however they were by no means the only victims of non consensual medical treatments , tests or use of tissues. often late stage cancer patients were injected with cancer cells to 'see what the effects would be' without the knowledge or consent of the patients. with cancerous HeLa cells to see what would happen. at the time there were three jewish doctors who refused to do this stating the nuremburg code which was created after the nuremberg trials. one is not allowed to get benefit from nazi doctors experiments on jewish prisoners. these three doctors resigned from the hospital not without informing reporters of the plot. dr. southam was suspended from the hospital and the experiment was stopped. this is not just a book filled with medical jargon. it also tells the story of henrietta lacks the person as well as the lives of her family. i just watched this and i could not stop laughing. what i really like is that jack black is not apologetic about being jewish. he isn't all that observant but he is also matter of fact about it instead of self hating like the woody allen generation of hollywood jews. we've come along way baby. i have always admired the mosaics that have popped up in the nyc subway stations over the years. its like having a free museum throughout the city. i have a lot of photos of subway art. in march the mta launched a smartphone app that charts the location of all of the subway art throughout the system. the app is called meridian and in this app there is a mta section that lists the subway art. i plan to ride the subway and photograph all of this art. with this new app i will know which stations to check out. when i first came to new york ,which is more years ago than i would care to admit, i was mesmerized by all of the graffiti on the subway trains and just around the city in general. this video describes the making of a subway art book written over 25 years ago. i was out and about yesterday in boro park and i found these signs and i thought that i would share them with you . they gave me a chuckle even though it was not their intended purpose. even though i went to jewish schools i was one of the few people who had curly frizzy hair. straight hair ruled. straight hair was always more glamorous. i always wanted to have smooth , shiny, straight hair like the women in the shampoo commercials on tv. alas that was not meant to be. i know a lot of closeted curly haired girls. they will never let anyone see them with curly hair and they go weekly to have someone blow their hair straight. they fear rain as much as the wicked witch from the wizard of oz. i have my hair blown straight once in awhile but it is too much work to maintain straight hair when you have hair as curly as mine is. i resolved long ago to embrace my curls. this my friends is what i really like about the message of ouidad. though she is a business, she strives to empower those of us with curly hair to have pride in our hair. i have curly hair. people think that you just wash your hair and voila you have beautiful curls. guess again. it took me until i was 27 to realize that you can only brush curly hair in the shower and perhaps when you are applying leave-in products when you get out of the shower. if you comb or brush your hair once it is dry you will ruin the curls and end up with a frizzy mess. recently i tried some of the ouidad hair products which were created specifically for curly hair by the curly hair guru ouidad. so far i really like them. they are the only curly hair products that do not leave my hair crunchy or sticky. so far i have tried the moisture lock leave-in conditioner in tandem with the climate control heat and humidity gel which seem to work well. ouidad has a salon on fifty-seventh street in nyc. i have never had my hair cut there because it is a bit too expensive for my pocketbook , but i think that the hair products are more reasonably priced and worth the expense. on ouidad's website she has user friendly instructional videos on how to style curly hair. several years ago i lost 25 from weight watchers. i've been back at weight watchers for almost a year and have only lost 6-7 pounds. i would totally give in the towel, but i have not been my starting weight from last year since last year. i think that once one has gone through the diet process a few times and have lost sizable amounts of weight it is harder to get back on track. the first time i lost weight it was a fun challenge. i lost 30 pounds in three months. the second time it took a bit longer . it took me 9 months to lose 27 pounds. this time around i am less enthusiastic. keeping weight off requires a lifestyle change. it also means that i won't be hungry but won't ever get to be as pleasantly satisfied when i reach my goal weight. i hate arguing with people. this is not to say that i always agree with others or that i never share differing opinions with others. for some people dissent is a sport. if they aren't verbally sparring with someone they feel dead. i find bickering unsettling and unpleasant. i run like the wind away from debates unless it is necessary. i prefer to discuss the things that bring people closer together rather than those that rip people apart. i am someone who needs a lot of personal space. it is somewhat difficult to be this way in a city that is full of physically and verbally pushy people. the worst offenders are frum people . they think that they can stand really close to you because they don't think you will beat them up because you are frum as well. i usually avoid stores in midwood during the busiest hours because i do not like the invasion of my space. i also try to go to personal space friendly stores such as any trader joe's , duane reade and cvs. it is most awful entering certain grocery stores in midwood. people congregate at the doorway and make it difficult to enter the store. when it is time to pay the person behind me always likes to stand close enough to me so my elbow jabs them when i am reaching into my wallet. they are in that much of a hurry. i always wonder what kind of married life these people have if they feel the need to stand that close to me in line at the supermarket. must not be too great.